Take the great taste of pumpkin pie and give it an upgrade. 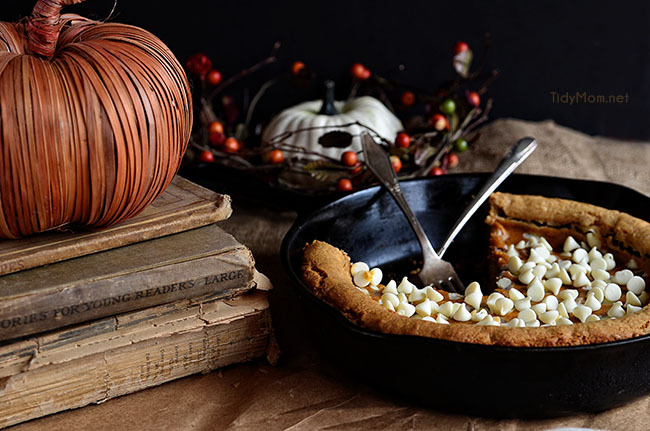 Pumpkin Cheesecake Skillet Blondie is a trifecta of flavors all in one decadent dessert, a first-class ticket to pumpkin heaven. 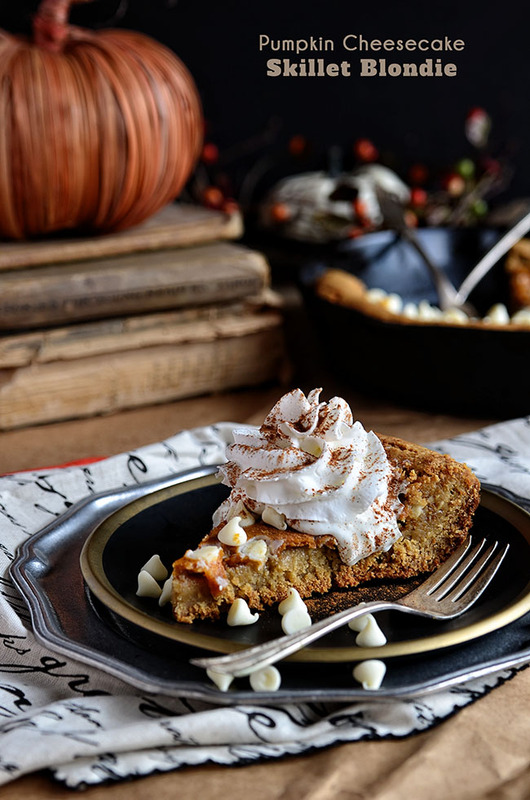 We just love pumpkin desserts, like Pumpkin Ice Box Cake, Pumpkin Spice Carmelita Bars and Pumpkin Monkey Bread. Don’t you just love fall? It’s like the start of something new. Time to switch wardrobes…… boots, sweaters and scarves. Watching all the leaves change to glorious colors is almost more exciting than seeing the new buds in the spring. It’s the time to pull out all the cold weather recipes, soups, stews, belly-warming meals, and pumpkin! We’ve been lucky here in St. Louis and have had a touch of cool fall temps sprinkled throughout the month of September, and being the good daughter she is, Allison felt that called for a pumpkin dessert and all of the warm spiciness that is associated with it! The girl takes after her mom and loves to bake. 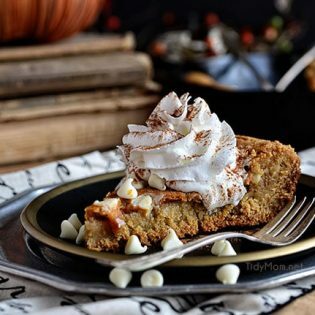 It had to be fate (or a Pinterest addiction, take your pick) that after she had decided to bake something with pumpkin, she signed into Pinterest and near the top of her feed saw that Megan of Country Clever had pinned a recipe for her Double Chocolate Pumpkin Cheesecake Brownie. Pumpkin, check! Easy, check! Quick, check!………..Obviously, it was meant to be. It was one of those desserts you can’t get off your mind. So much so, that she wondered what it would be like with a white chocolate blondie. That’s when the Pumpkin Cheesecake Skillet Blondie was born. The flavor and texture is similar to a pumpkin pie, in a bar form. 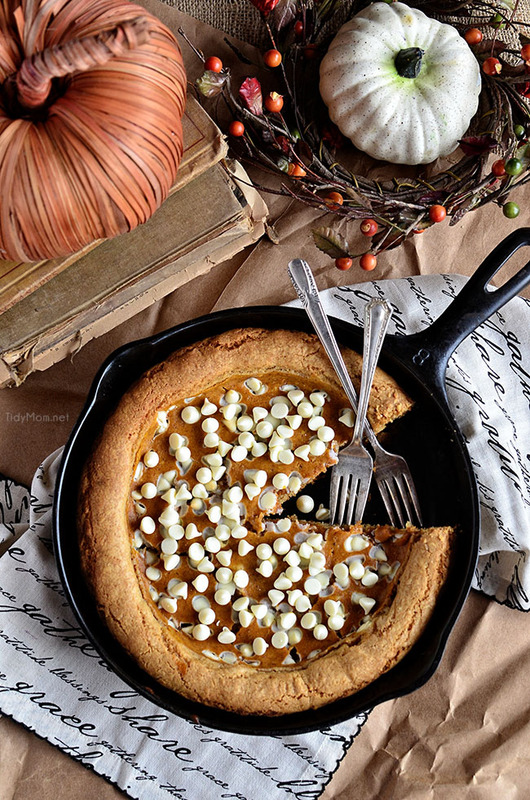 CHECK OUT HOW EASY THIS PUMPKIN CHEESECAKE SKILLET BLONDIE RECIPE IS TO MAKE! WATCH THE VIDEO! Afterward, it occurred to me that we could amp up this recipe by adding pecans to the blondies. Just like pumpkin is amped up by cinnamon and nutmeg, the same is true when it comes to throwing nuts into pumpkin recipes. Excuse me, while I go make another batch……like we needed an excuse to make it again 😉 Put this skillet blondie on your list of things to do. Because all Monday’s should begin with a Pumpkin Cheesecake Skillet Blondie. ENJOY! Heat your oven to 350° F and spray 8-10 inch cast iron skillet with non-stick spray. Melt white chocolate chips in the microwave. Stir and let cool. Next, using a large bowl, whisk melted butter, sugars, eggs, and vanilla extract and melted chocolate until well combined. Add baking soda, salt, and flour until dough forms. Spoon the batter into your greased skillet. Pat out batter, leaving a 1/2 inch gap from the edge of the skillet. Use your fingers to form a ridge on the edge of the dough to hold the cheesecake filling. Using an electric mixer, cream softened cream cheese and sugar until smooth. Stir in pumpkin puree, egg and pumpkin pie spice until smooth. Pour on top of the brownie in the skillet. Sprinkle cheesecake filling with remaining 1/4 cup of white chocolate chips. Place in oven and bake for 25-30 minutes or until a knife or toothpick inserted into the center comes out clean. Do not over bake. 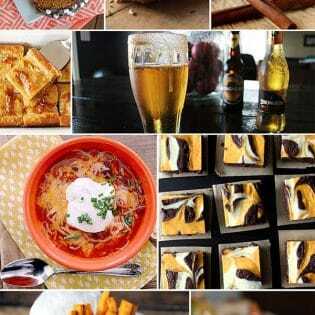 Need more pumpkin recipes? 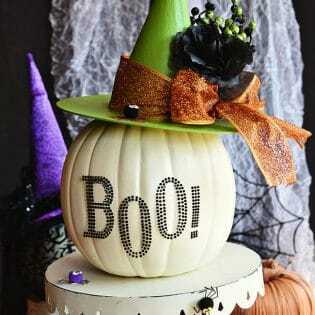 Be sure to follow my Pumpkin Pinterest Board Follow Cheryl Sousan | Tidymom.net’s board #Pumpkin #Recipes on Pinterest. 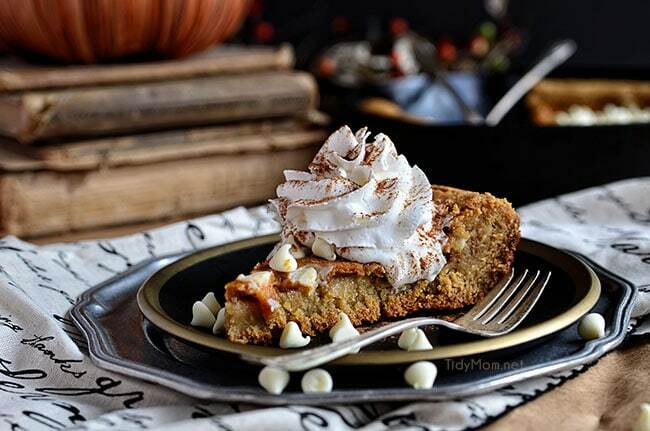 Like this Pumpkin Cheesecake Skillet Blondie recipe? Pin it! This blondie will be fabulous enjoyed with a Caramel Apple Moscow Mule Fall Cocktail after dinner with guests. Upgrade the great taste of pumpkin pie for a first-class ticket to pumpkin heaven. Heat oven to 350 degrees and spray 8-10 inch cast iron skillet with non-stick spray. Place 1 cup of white chocolate chips in a small bowl and heat in microwave for 1 minute to melt. Remove bowl and stir. If all chips are not melted, microwave for another 30 seconds. Stir and let cool. In a large bowl, whisk melted butter, sugars, eggs, and vanilla and melted chocolate until well combined. Add baking soda, salt and flour until dough forms. Spoon batter into greased skillet. Pat out batter, leaving a 1/2 inch gap from the edge of the skillet. Use your fingers to form a ridge on the edge of the dough to hold the cheesecake filling. Using an electric mixer, cream softened cream cheese and sugar until smooth. Stir in the pumpkin puree, egg and pumpkin pie spice until smooth. Pour on top of the brownie in the skillet. What a dream!! This looks lovely! Wow. Love the use of the skillet to make these. Such a great flavor combo. Love a skillet recipe!! This one looks fantastic!! You have such a smart daughter! I love the changing wardrobe and flavors of fall. This skillet cookie looks to die for! This looks absolutely amazing, Cheryl! Oh my goodness – this looks amazing!! Totally after my heart with this dessert. I’m such a sucker for anything cheesecake. Mondays would be so much better if they all started with pumpkin skillet blondies! Oh man, I am drooling over this this morning! What a fabulous idea. And the photos are gorgeous! I love skillet desserts! These blondies look fantastic! You’ve hit all my favorite spots right here. Pumpkin = yes. Cheesecake = you know it! Blondies – For life. Skillet = All day long! Needless to say, I am so in love with you… and I am definitely pinning this! Wow Cheryl it’s been a long time since I’ve stopped by. None of my email requests are coming to my inbox anymore so it’s hard to recall all of them. I can’t believe yours escaped me considering it’s always been a favorite of mine. As always this recipe looks wonderful and one to definitely store to try this fall. The weather is perfect here today, isn’t it? Baking it in a skillet is such a fun way to serve it. It looks delicious! I so have to give these a whirl! Wow, all I have to say is yummy! Can’t wait to try this out! Found you on the Whipperberry link up! This could easily become my new favorite fall dessert! All my favorites wrapped into one—pumpkin, white chocolate, cheesecake and blondies!! This is a KILLER dish! I still absolutely LOVE that your girls made this!! I mean – BEST DAY! Still makes me smile. We are intrinsically liked through the power of the skillet brownie sisterhood! I have all of the ingredients of this! I’m totally giving it a try. Such a gorgeous fall dessert! This skillet blondie looks to die for! I haven’t made nearly enough pumpkin treats this fall. I need to get on this ASAP! If I don’t have a cast iron skillet can I bake this in a cake pan?? Cast iron is slower to heat, but holds heat better, if you want to use a cake pan, you may have to bake it longer or raise the temperature by about 25 degrees to get the same outcome. The brown sugar is missing from the directions. sorry, you put it in the same time as the white sugar –I corrected the recipe to reflect that! thanks!